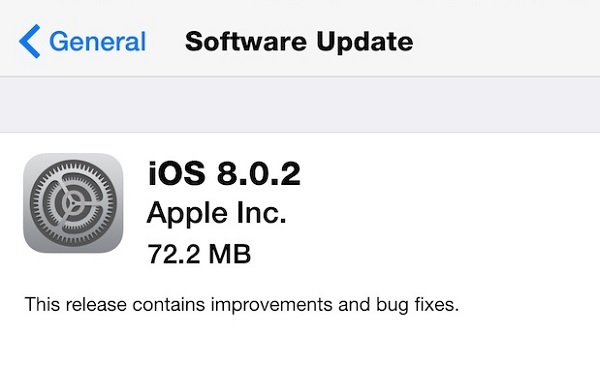 Following all the drama around iOS 8.0.2 update Apple has finally released the new iOS 8.0.2 update for all devices. The new update fixes all the problems brought by the previous release in addition to fixes for HealthKit and keyboard for all users. The update is available through over-the-air and iTunes. It supports all devices that are capable of running iOS 8 including the newly released iPhone 6 and iPhone 6 Plus. With the fixes released for HealthKit users will now be able to download HealthKit based applications from the App Store and take advantage of the new iOS 8 capability. It also fixes the a problem that affected 3rd party keyboards, which caused them to get deselected when user entered the passcode on the lockscreen. If you are running iOS 8.0 then it is a good idea to upgrade to iOS 8.0.2 as it brings essential fixes. If you are sticking to iOS 7 to be able to use jailbreak then you should avoid this update as well until further details about the release of iOS 8 Pangu or Evasi0n tool are released. In order to download iOS 8.0.2 on your device simply go to Settings > General > Software Update. Alternatively you can connect to iTunes and click on the ‘Check for Updates’ button. It is a 72.2MB download on the iPhone.